Located at 4811 East Johnson Avenue, the 98-room hotel will operate as a Marriott franchise, owned and managed by Hunt Services Inc. of Jackson, Tennessee. 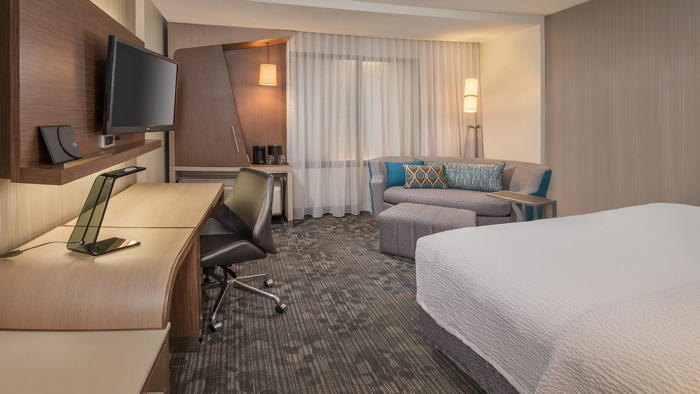 Courtyard by Marriott Jonesboro is scheduled to open its doors in Jonesboro, Arkansas this Friday, December 21, 2018. Featuring an innovative lobby space as well as Courtyard&apos;s latest contemporary room design, the new hotel provides flexibility and choices that allow guests to optimize and elevate their travel experience. Located at 4811 East Johnson Avenue, the 98-room hotel will operate as a Marriott franchise, owned and managed by Hunt Services Inc. of Jackson, Tennessee. Whether traveling for business or pleasure, the Courtyard Jonesboro offers guests convenient access to Arkansas State University, First National Bank Arena and Joe Mack Campbell Park. Courtyard constantly researches trends and evolves to meet the changing needs of its guests. The latest room design offers hybrid zones for working, sleeping, relaxing and getting ready. Indirect lighting and a neutral, tone-on-tone color palette makes for a soothing and calm environment. "From day one, Courtyard has prided itself as a brand that listens to business travelers," said Janis Milham, senior vice president and global brand leader, Classic Select Brands. "Today&apos;s technology has changed how people travel. Our guests want a room that has purpose and flexibility that enables a seamless transition between relaxing and working. Courtyard is designed to offer them a relaxing and functional space to work the way they want to, when they want to." The new room design is intuitive and thoughtful, offering flexible yet comfortable spaces that enable technology. Upon arrival, guests can store bags on the "Luggage Drop" and plug personal devices into the "Tech Drop" ledge for seamless technology integration. Signature furniture and architectural elements replace traditional art in the new guestroom. The "LoungeAround" sofa offers a pop of color and a comfortable area for relaxing or for working. The new design also features a light desk on wheels, allowing guests to work from anywhere in the room. An upgraded, more spacious layout creates an enhanced bathroom experience. A "Shower Nook" housing shampoos and towels, makes amenities accessible without having to leave the shower. The Courtyard Jonesboro features the brand&apos;s latest lobby design, where guests can enjoy an open and modern environment outside of their rooms. The newly designed Bistro is the epicenter of the lobby, which fosters social connections and collaboration with more flexible and informal seating options. The Bistro offers guests a wide variety of "made to order" breakfast and dinner items, "grab and go" options, and also features an array of cocktails, beer and wine for guests to unwind at the end of the day. Green has been Courtyard&apos;s signature color since Marriott launched the brand 30 years ago. Now it is even greener with the introduction of a guest recycling program for the environment. Receptacles for paper, glass, plastic and metal are conveniently located by side exits. The four-story hotel features an outdoor patio with fire pits, a fitness center and guest laundry, and offers 891 square feet of meeting space to accommodate functions of up to 50 people. Are you with Courtyard by Marriott? If you are a member of Courtyard by Marriott you may be interested in learning how to optimize your content on our network.